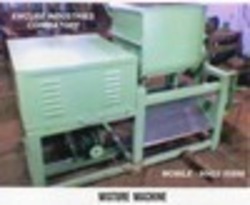 We are specialize in manufacturing Technically advanced and complete range of Soap processing Machinery. These products are used for the processing of toilet Soaps, Bar soaps, Laundry soaps and Detergent soaps. Our automotive soap processing machines produce various type of soaps that are used for washing, Cleaning and bathing. In order to keep pace with never ending demands of clients, our company offers Automatic Soap Cutting Machine. Intech Lamp Machinery (P) Ltd.